Pecros.com - It's no longer a secret that natural ingredients such as fruit, honey, milk are the secrets of natural beauty. Those are easy to find and have affordable prices. Of course you are also familiar with various types of skin care that can be made at home such as honey masks, rose water toner, or coffee scrubs. Did you know, yogurt is also one of the ingredients that are often used in DIY beauty? You might hear the benefits of milk, but what about the benefits of this one dairy product? frozen yogurt is not only delicious, it turns out there are also benefits for beauty. Come on, see here! Spending time everyday in an air-conditioned room will certainly make the skin moisture levels decrease. As a result, the skin feels dry. Moreover, dry skin can also be a cause of various other skin problems such as zits. Well, it turns out yogurt can be used to deal with dry skin. 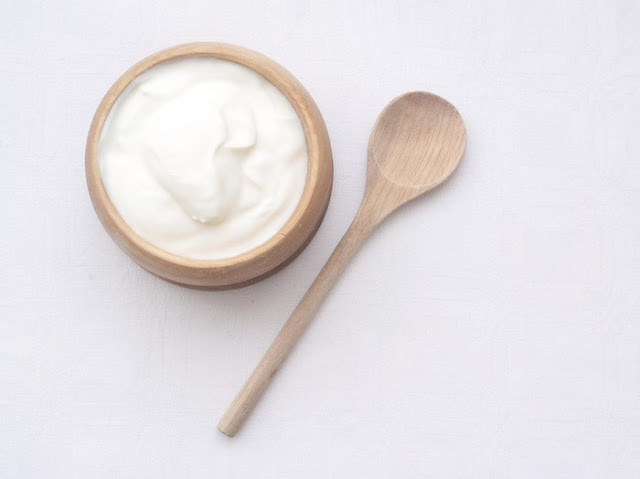 This is because yogurt has lactic acid, anti-inflammatory properties, and antioxidants that can moisturize, nourish, increase skin elasticity, and relieve itching due to dry skin. evenly on the face and skin. Let stand for 20 minutes, then rinse with water until clean. When you return from vacation in a hot weather, you often get sunburn. Not only makes syour skin red, burning skin will certainly feel sore when touched. Instead of spending the rest of your vacation complaining about sunburn, let's reduce it with yogurt! Yogurt is rich in zinc which can help you to get rid of sunburned skin. To be more effective, you can also combine yogurt with a variety of essential oils that can overcome sunburn problems on the skin such as peppermint or lavender. How to use: Mix yogurt and 1-2 drops of essential oil, then apply to the problem area of the skin. The most common skin problem is acne. Maybe you have done many ways to get rid of acne from natural methods or even using acid. Yogurt can actually help you get rid of acne since it contains lactic acid which can act as an exfoliator and natural facial cleanser. Not only that, processed milk is also anti-bacterial so it can kill the bacteria that cause acne. Of course, in addition to get rid of acne, yogurt will also moisturize and nourish the skin when applied. How to use: Apply yogurt to the acne area then massage gently for a few minutes. Let stand for 15 minutes, then rinse with water until clean. Yogurt works like a scrub on the face. Lactic acid helps to remove dead skin cells and does not clog pores. Calcium content also helps the skin regeneration process so it makes you look younger. Using a yogurt mask can kill the bacteria that cause acne. Yogurt contains zinc which can reduce inflammation and minimize oil production. Probiotics in yogurt can destroy pathogenic bacteria and produce flawless faces. Yogurt that is made into a mask on the face helps to get rid of panda eyes. The content of Zinc helps brighten the skin. Black eye circles can be lost by using a yogurt mask in the dark area under the eyes. Do this treatment regularly for better result.